Orginally published as a KnightWatch Press volume, Machina Mortis (tr. 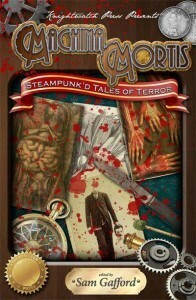 from latin: Devices of Death) is a volume of Steampunk’d Terror Tales edited by Sam Gafford. Within these pages you will find many different aspects of the horrific side of Steampunk. In “Last Flight of the Bismarck” by Scott Baker, the world is threatened by technological zombies with only two young adventurers standing in their way. The threat is more subliminal in Salena Moffet’s “Bedlam” where it’s hard to determine what is reality? “The Thumping in the Basement” by Tonia Brown considers the matter of limb and organ replacement and the ethics, or lack of, behind it. Stories like Marie Andrews’ “Clockwork Carousel” take us to new realms of horror. I dare anyone to look at a circus carousel the same way after reading this unnerving tale. Victorian settings are used in two very different tales. “Whitechapel Transfer” by Theresa Derwin connects the hideous crimes of Jack the Ripper with futuristic Steampunkish technology while “The Garretton Ghoul” by Christine Morgan finds another community rocked by a series of mysterious and gruesome murders. Buck Weiss contributes a terror filled adventure in “The Black Banshee” that features two amateur sleuths of which I am sure we will read more about soon. So too is A. J. Sikes’ tale, “The Three Blind Men”, which sets the stage for more tales of technological terror. Taking us into the future is Nathan Robinson with “The Last of the Bad Few” which gives a different spin to the technological horror of Steampunk. And, as a contrast, “Nothing but a Dog: A Trio of Travellers Tale” by Travis Sivart brings us back to an Old-World European view of horror… with a dash of Steampunk added for good measure. These stories represent an ability to look beyond a genre’s preconceptions and create new horizons. These writers are explorers in a wild, new land and, before us, they lay a vast vista of exciting, and terrifying, possibilities. It should be noted that the first edition of Machina Mortis will be on sale for a limited period as the book will be revised for relaunch – with a completely new cover – under the Fringeworks’ imprint. Edited by Chris Amies, NeaDNAthal is one of those infuriatingly slow books in happening. Originally schedules for publication in July 2014, it has been slowly progressing towards publication ever since. 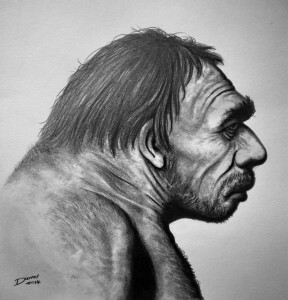 The anthology will focus on the reappearance of Neanderthal Man in the modern age. A sort of Jurassic Park for cavemen. Cover: Neanderthal, copyright Darrel Bevan, 2014.